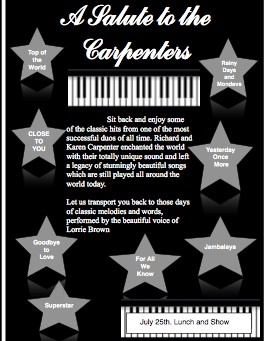 A non stop foot tapping hour of hits from the 1960’s with tributes to the biggest stars of the era including Tom Jones, Lulu, Dusty Springfield, Petula Clark, Gene Pitney and Sonny and Cher. Once again, this show is selling well on the lunchtime circuit a 60 min show but is also available as a full 2hr theatre show with extra tributes to, Cilla Black, Englebert Humperdinck and . 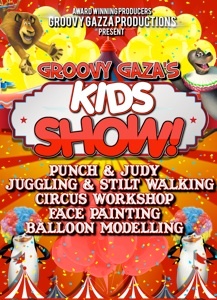 Groovy Gazza Productions are now in their 8th year and quickly gaining a reputation for producing quality shows which regularly sell out theatres, hotels and restaurants. GGP are regularly asked to produce shows for hotel chains such as, De Vere and Best Western. In the last 12 months they have produced 4 themed breaks for De Vere Hotels around the UK, putting in all the entertainment. They currently have 7 shows performing across the country and recently 2 newspapers have booked GGP to promote their events. With every lunchtime performance selling out 150 tickets. Several acts have individual shows available seperately. List at the bottom of the page. A hugely successful show which regularly sells out on the lunchtime hotel circuit. Carlton Park in Rotherham and Pastures Lodge in Mexbrough are 2 venues who regularly book the show and sell out upto 150 tickets at a time. Both the Rotherham Advertiser and Sheffield Mercury newspapers have booked the show to promote their events. National Award winner Lorrie Brown portrays the forces sweetheaart and takes the audience back on a journey to the songs of the 1940’s. as voted by the Entertainments Agents Association. Blackpool Opera House, St Davids Hall Cardiff, Bournmouth Pavillion and the Blackpool Tower Ballroom. She has also sung to the Chelsea Pensioners twice and sang at West Ham FC on the pitch at half time to 33,000 spectators on Remembrance Sunday 2009. 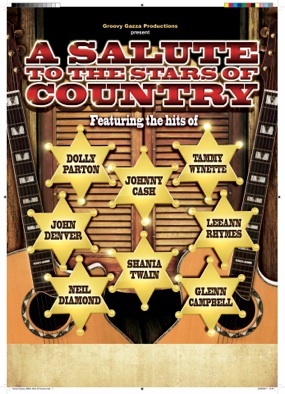 A Salute to the 1940’s is a fantastic traditional variety show packed with tributes to the stars of the 40’s. As soon as the audience walk into the room they are transported back in time to the 1940’s with flags, posters, bunting and webbing. Vera Lynn, George Formby, Gracie Fields, Andrews Sisters and Al Jolson/G.I Frank Sinatra. all held together by Warden Braithwaite, the shows very own compere/warden. The show will fit into any size of venue, playing restaurants and golf clubs as well as theatres and outdoor festivals. Royal Elephant Restaurant, Dinnington. 5 sold out shows. Close to You, Yesterday Once More, Superstar, Rainy Days and Mondays, Top of the World. 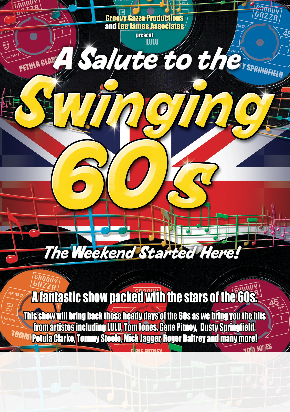 Shows around the UK for Best Western Hotels and as part of a 1970’s tribute show. Everything you need for a fabulous childrens party/event. A tribute to an iconic artiste from the 70’s, Kate Bush. Can be booked either solo with backing tracks or a live stage show with a 4 piece band of supertalented musicians. Telling the story of how Kate Bush rose to the dizzy heights and is still enduring with fans snapping up any chance to see Kate in her recent concerts. Lorrie recreating 2 classic Kate Bush videos. If your a fan of the classic 50’s hits, this is the show for you. A non stop barrage of hits from 2 of the greatest icons in the 50’s. Featuring 2 highly experienced performers bringing you a fabulous night of entertainment. Can be booked as a non stop 75 min dance act packed with the floor fillers that made ABBA such a success, or as a 2 hr theatre show featuring the Story of ABBA. 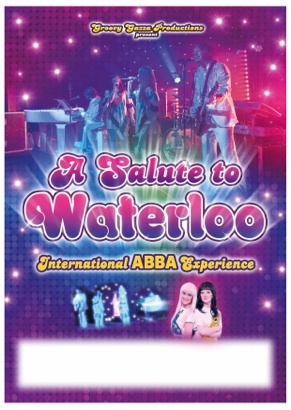 A Salute to Waterloo is made up of 4 highly experienced performers featuring Bjorn who worked for the original UK ABBA tribute band ‘Voulez Vous’ for 2yrs touring the country. Also in the line up, Agnetha is a national award winnng tribute artiste and ‘Frida’ has appeared on BBC TV as part of a Eurovision Contest entrant. The show can also be booked as a duo with the girls working to pro backing tracks. A SALUTE TO WATERLOO have performed across Germany in military bases, appeared as support for 70’s chart act ‘Le Chic’ and toured theatres across the UK as well as being booked for private parties, Inc performing for top artistes from the world of entertainment. and many dance floor fillers. 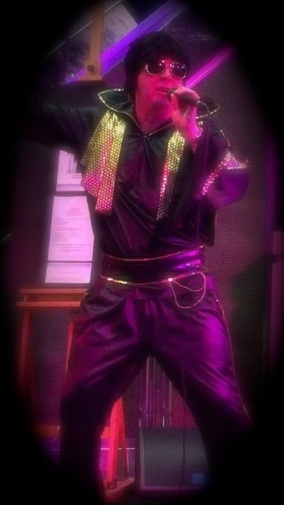 Gary has been touring the UK appearing in Best Western and De Vere hotels entertaining coach parties of Elvis fans. 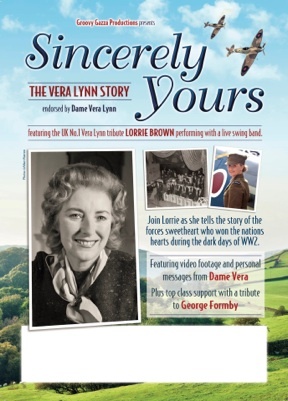 Endorsed by Dame Vera Lynn, we will take you through the amazing life of the forces sweetheart. 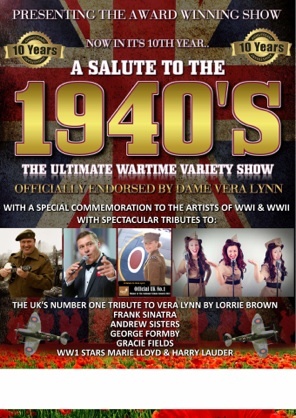 This show did a 45 date theatre tour in 2017, celebrating the 100th birthday of Dame Vera Lynn. Performing with a live 7 piece band and George Formby tribute. 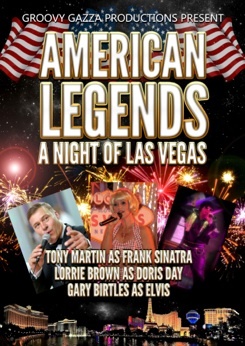 Featuring 2 award winning tribute artistes, this show brings Las Vegas to your venue with tributes to 3 of the most iconic acts of the 50’s and 60’s. A traditional variety show takes you back to the days of the 1970’s when variety was king. Comedy, Song, Music and speciality reign in this original show featuring Melissa Radway as Shirley Bassey topping the bill and several top class variety acts. All held together with Gary Birtles as your compere. For the last 3 yrs we have arranged the annual tribute festival for Killamarsh Parish Council providing everything from the stage, power, marquees, childrens entertainment, sound and most importantly a top line up of world class tributes. 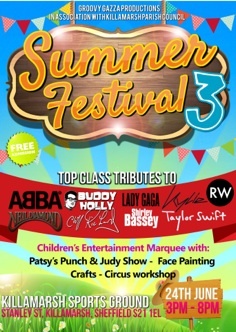 We cant guarantee the weather but we can guarantee a fabulous show which will have your revellers dancing in the streets. is all things Country + Western. C+W scene this show has been selling out function rooms wherever it plays.